“It is not necessary that the Turkish Nation and the High As sembly should occupy themselves so minutely with the Caliphate and the Monarchy, with the Caliph and the Sultan, while we are struggling to secure the existence and independence of our country. Our higher interests demand that we should not discuss this at all at the present moment. If the question should arise as to whether we ought to remain loyal and true to the present Caliph and Sultan well, this man is a traitor, he is a tool of the enemy employed against our country and our nation. If the nation considers him in the light of Caliph and Sultan, it will be obliged to obey bis orders and thereby realise the enemy s plans and designs. Moreover, a personage who would be a traitor and could be prevented from exercising his authority and making use of the power bestowed upon him by his position, could not hold the exalted title of Caliph or Sultan. If you want to say: Let us depose Kim and choose someone else in his place/ this would lead to no way out of the difficulty, because the present state of affairs and the conditions prevailing at this hour would not allow of it being done. For the person who must be dethroned is not in the midst of his nation but in the hands of the enemy, and if we intended to ignore Ms existence and recognise someone in his stead, the present Caliph and Sultan would not surrender his rights, but would retain the seat he occupies to-day with his Ministry in Constantinople and would continue to carry on his office. Will the nation and the High Assembly in such an event abandon their high aims and throw themselves into a fight for a Caliph? In short, this question is of far-reaching importance and difficulty. Its solution is not one which we are struggling to discover to-day. “If we would undertake the task of finally settling this problem, we would not succeed in this at the present moment; but the hour for that will come later. A week before I had made these statements I had laid a draft before the Assembly which was dated the i3 t]1 September, 1920. This draft, which contained the decisions regarding the organisation of the administration and all the political, social, civil and military points of view in a condensed form, was read at the sitting of the Assembly on the i8 th September. And thus the first Constitution Act, which was based on this draft, was passed four months later. I will ask you now to let me continue to give you an account of our correpondence with Stambul. In a telegram dated 29 th January, Tewfik Pasha repeated the contents of his telegram of the 27 th . *) The fights of the immediate successors of Mohamed. Angora, 30 th January, 1921. To His Highness Tewfik Pasha, Stambul. The change which has recently taken place in the policy of the Entente in favour of Turkey is the result of the devoted determination and courage of sacrifice that has been shown by the nation. The ad vantages arising from this situation, which has been brought about by a formal rejection of the Treaty of Sevres by the Grand National Assembly of Turkey, advantages which are most in accord with the national interests, can only be attained if the delegates who are to take part in the London Conference are authorised directly by the Grand National Assembly, which represents the national will. The delegates of your body, which is the immediate successor of the one that signed the fatal Treaty of Sevres, will not be in a po sition to obtain favourable conditions for the State and the nation. Consequently, in the higher interests of our country it is essential that you should keep away from these Peace negotiations and leave the question entirely to the delegates of the Grand National Assembly to represent the national unity. 1. The Turkish delegation that will take part in the London Con ference will be appointed and dispatched solely by the Government of the Grand National Assembly of Turkey. 2. Certain special advisers, whom we believe it to be expedient to add to the delegation, will be placed at your disposal with the ne cessary credentials. 3. You will inform the Entente Powers that the delegation sent by us is the only one representing the interests of the whole of Turkey. 4. In the event of your body not accepting these resolutions which, as time is pressing, are final and definite, it will have to bear all the responsibility in the eyes of history and of the entire nation. Fewsi, President of the Committee. We thought it adivisable that Izzet Pasha, Tewfik Pasha s as sistant, who was at Angora, should also send a telegram. Izzet Pasha s telegram was as follows: Telegram in cipher. Angora, 30^ January, 1921. To His Highness Tewfik Pasha, Stambul. We have been made aware of the open correspondence which has been carried on between the President of the Grand National As sembly of Turkey and Your Highness regarding the Conference which is to take place in London at the end of February. Although we scarcely consider ourselves justified to express an opinion after the failure of our mission, our patriotic feelings impel us to give you a picture of the present situation and the views that are current here. It is considered natural that the occupation of Constantinople renders it impossible for the Government there to safeguard the vital interests of the nation. Dreading that it will pave the way for discord later on between Anatolia and Stambul, the idea of two separate delegations taking part in the Conference is not favourably considered here. His Ex cellency Mustapha Kemal Pasha himself has no authority to depart from the opinions he has expressed in his telegrams. With God s help, the upheavals in Anatolia and the activities of the rebel bands have been suppressed. A strong army and a strong government have been organised here. Sentiments of loyalty towards your person move me to urge you to act in a way that will not result in failure of the negotiations which may induce Europe to alter the Treaty of Sevres in our favour. A discussion on certain details and formal questions is feasible, provided that the fundamental condition remains intact, namely, that His Majesty recognises the Grand National Assembly of Turkey. I beg you to keep me well informed, so that we shall not fail to make the best of this opportunity. Ahmed Izzet. Telegram in cipher. Stambul, 3i st January, 1921. To His Excellency Izzet Pasha, Angora. Reply to your telegram of the 30 th January, 1921. The question must arise as to what point we can bring into agree ment with the clear wording of the law the fact that essential altera tions are made and confirmed in the Constitution to maintain which we have all pledged ourselves and which are contrary to its pro visions. This question is of a domestic nature and can only be settled in the necessary way if efforts are made to secure the acceptance of the alterations demanded from us and explained in the telegram which His Excellency Mustapha Kemal Pasha sent to us through . . . by the Entente Powers, and when this desired aim has been reached, As we explained in our telegram yesterday, if we should act in a manner contrary to this it would result in our presence at the Conference being refused, and the Ottoman sovereignty over Con stantinople would be immediately abolished and no further resistance could be offered to the Greek claims, which might even be regarded as just. It is evident from the telegrams that one aspect of the question has not been clearly understood. What suggests the idea that two delegations will be sent to the Conference “ours” and “yonis”? As the object and means of defence are identical if complete unity prevails, a delegation consisting of deputies appointed by Angora, which would leave at the same time with those sent by the Govern ment that is recognised by the Entente Powers, would be a united delegation comprising a single body, endowed with the necessary full powers. They will be able to defend the national cause unanimously and without fear. The fact that you ask us to induce the Entente Powers to recognise the delegates shows that you, also, have a just appreciation of this necessity. The Note sent to us as well as your explanations clearly prove that the Entente Powers will not agree to the delegates from Anatolia going alone to the Conference. They will be admitted if they come with the delegates sent by the Government. If you insist on this dual representation, it is more than likely that no delegation at all, representing either one party or the other, will be admitted. If in this connection it is probable that delegates from here will be ad mitted as the only ones, the same does not apply to delegates from Anatolia. Therefore, this alteration, which is the result of heavy sacrifices, will not be to our advantage, because, as the friends of the Greeks are in the majority in Entente circles, they will be able to draw those who are favourably inclined towards us over to their side by spread ing the rumour that the Turks are in favour of the continuation of war in the Orient and that they do not desire unity and peace. Thereby we should have taken an opportunity to put ourselves in the wrong and our enemies in the right. If we were to send a united delegation even should our demands not be accepted we would be in the position of not having turned general opinion against us, but might even succeed in gaining over an important number of those who are antagonistic to us to advocate our cause. Time is pressing; we have no time to lose in carrying on further correspondence. The interests of the country and nation require that the delegates shall be sent off immediately. It is also necessary that Your Excellency and your honourable colleagues should return, because we are convinced that the time has arrived when we ought to make use of your personal experience and your familiarity with the opinions prevailing where you are, and that we are in agree ment as to the necessity of winning opinions for them. Telegram in cipher. Stambul, I st February, 1921. To His Excellency Fewsi Pasha, Angora. Reply to your telegram of 30 th January, 1921. Although a changed attitude in regard to Greece since the return of King Constantine to Athens is noticeable in the circles of the En tente and in public opinion, which has caused Europe to alter their opinion in our favour, there are some politicians who defend the Greeks and obstinately maintain that Turkey, by the terms of the Treaty of Sevres, must be annihilated in her present, or at all events scarcely altered, form. According to reliable information which we have received, the fact that these politicians have adopted and re present the idea of inviting representatives of Anatolia also to the Conference, is to be attributed to their conviction that Anatolia will not accept this invitation, their intention being to make this refusal a pretext to justify coercive measures against us and to win public opinion in favour of their policy. For these reasons it is imperatively necessary that we should go to the Conference immediately and unitedly work in harmony for the recognition of our rights. If we discover that our just and legitimate claims are to be rejected and if it should prove necessary for us to leave the Conference, this will not be used as an effective weapon against us in the hands of our enemies. 1. Constantinople and the Straits would be finally lost to Ottoman sovereignty if unity could not have been established. 2. The Entente Powers would be able to support Greece financially and militarily, and would commence a united offensive in Anatolia, which would expose the Turkish element, which has already been terribly decimated by all the previous wars, to further annihilation. Telegram in cipher. Stambul, 5 th February, 1921. To His Excellency Mustapha Kemal Pasha, Angora. Telegram in cipher. Stambul, 8 th Februray, 1921. Was this telegram sent with the intention of letting us know that the Greeks would begin an offensive and that the delegates from Angora would not be allowed to attend the Conference if they came alone? It is very difficult to say. Or, did they want to emphasise the second part of the telegram by putting forward the threat of an offensive by hostile troops to the number of seventy or eighty thousand men? Was it that Tewfik Pasha had informed the representatives of the Entente of our opinion with regard to sending delegates, as we had told him, and did he mean in the second part of his telegram to imply the answer that he had received? This question also was not quite clear. Stambul, 8 th February, 1921. To His Excellency Mustapha Kemal Pasha, Angora. As a result of the advice given him by some French politicians, whose kindly feeling towards us is beyond doubt, our delegate in Paris recommends us not to carry out an attack in Cilicia, so as not to provoke public opinion in France. the Grand Vizier. We had received a great deal of advice of this description from the different Governments in Stambul. Had the man who had spoken to this “well-meaning” person who had advised us to abstain from making this attack and who, like a phonograph, had repeated all he had heard, perhaps by chance, asked this “well-meaning” person whether he had also advised the competent authorities to abstain from attacking us? If the answer were in the negative, how could he have put faith in the “well-meaning” intentions exhibited by this person. There were men who seemed to tender advice not to provoke public opinion in the country belonging to those who occupied another country; but why had the Ottoman statesman the strange peculiarity of never asking such persons why they had injured the nation whose country they occupied and why they continued to occupy it? In short, Gentlemen, you will see that it was impossible to come to an understanding with Tewfik Pasha and his colleagues, either on principles or on ideas and conceptions in particular. Eventually the question was brought before the Assembly. I put forward two proposals to the Assembly. The first was that we should inform Constantinople definitely as to the conditions and intentions of the country and the nation, and the second was that we should send an independent delegation to London in case we should be specially invited to do so. Both proposals were agreed to. ranks against their own nation. The Government of the present Caliph and Sultan, the successor of a dynasty that had inherited the throne of the last Byzantine emperor who, in the latter days of Byzantium when the Fatih*) who demanded from him the surrender of the town, had replied: I can only surrender this country which has been entrusted to me by God to God alone, this same Govern ment, I say, is now at work trying to bind the hands of this people that does not want to become a slave and hand it over to our enemies. This first phase came to an end through the defeat of the Govern ment and its allies. The second kind of Government is the Council whose President is Tewfik Pasha, who, regarding his intentions, de clares himself to be on the side of the struggle for the defence of Anatolia, but who in his unaccountable blindness and obstinacy is standing in the way of the conclusion of a peace which the country is striving to obtain. The statesmen and dignitaries who are members of the Council and have accepted the decree of slavery presented to them by the Entente Powers with expressions of esteem, and who have signed this decree, are to-day nothing but a discarded authority no longer wielding any power in the country. Anatolia and Constantinople have become two separate parties representing the contradiction and antagonism between independence and slavery, between freedom and subjection. , ? We want to incorporate that part of the country which has lost its free right of determination and has been subjugated with the free and independent part. The statesmen in Stambul want to incorporate the free part, which constitutes the majority and which is resolved resolutely and gloriously to defend itself against a world of enemies, with the subjugated and enslaved part. 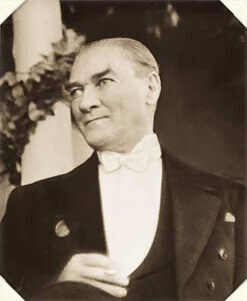 We shall never be able to consent that the Grand National Assembly, which represents the whole of Anatolia all children of the country who love their free dom and independence, as well as the oppressed soul of Islam to-day should be subordinated to a weak body in Constantinople which is deprived of its freedom. An independent and separate delegation was formed under the presidency of Bekir Sami Bey, the Foreign Minister. It was intended that this delegation should not take part in the London Conference unless it was specially invited to do so, but in order to save time they left for Rome via Adalia. After having been informed by Count Sforza, the Italian Foreign Minister, that they had been specially invited to attend the Con ference, they went on to London. The London Conference lasted from the 23 rd February to the 12 th March, 1921. It did not produce any positive result. The Entente Powers wanted us to promise that we would accept the result of an inquiry which they proposed to make regarding the population at Smyrna and in Thrace. At first our delegation had agreed to this, but after receiving a hint that came from Angora they proposed that this inquiry should be made dependent on the abolition of the Greek administration. We had become clear about the fact that the En tente Powers intended to guarantee the honourable execution of the other stipulations of the Treaty of Sfevres without any opposition from our side. The proposals made to this effect had been replied to by our delegation in a way that was tantamount to a refusal. As for the Greek delegation, they had declined to accept an inquiry on principle. Thereupon the delegates of the Entente Powers had pre sented to both delegations the Turkish and the Greek a draft which contained certain suggestions and had asked them to give the Conference the replies that they would receive from their Govern ments to these proposals. Increase of the actual strength of the special troops and gen darmerie which had been allowed to us to a very slight extent; a slight decrease in the number of foreign officers who were to remain in the country; a slight reduction of the zone of the Straits; a slight alleviation of the restrictions which had been imposed on our Budget and of our right to impose a tax on concessions in the sphere of public works . . . ; and, finally, some indistinct promises which could raise some hope of alterations being made in the Treaty of Sevres regarding the Capitulations, judicial affairs, foreign postal matters, Kur distan, etc. The delimitation of the frontiers of Armenia according to this draft were to be entrusted to a Commission appointed by the League of Nations. A special administration was to be established in the dis trict of Smyrna. The province of Smyrna was nominally to be restored to us, but Greek troops were to remain in the town of Smyrna; order in the Sanjak was to be secured by Entente officers, and the gen darmerie force in this Sanjak was to be composed of different elements in proportion to the composition of the population. A Christian governor was to be appointed over the province of Smyrna, which was to pay an annual tribute to Turkey and which would be liable to be increased in proportion to the augmentation of the revenues. This proposed modus vivendi for the province of Smyrna was put forward in such a way that it could be altered by the League of Na tions after the lapse of five years on application from either side. Without waiting for the reply which the Entente Powers would receive concerning the proposal they had made through the dele gation and while our delegation was still en route, the Greeks opened their offensive with all their troops and on all the fronts. You see, Gentlemen, that the Greek offensive compels us to leave our description of the London Conference. Let me now tell you about this offensive and what was the result of it. Now it was our turn. On the 3i st March Isrnet Pasha began a counter-attack, defeated the enemy on the same night and forced him to retire. This victory was the second at Inongu recorded in the history of the revolution. From Metresse Tepe, I st April, 1921. Position observed at 6.30 p.m. from Metresse Tepe. An enemy division, in all probability a rear-guard, which since the morning has been in a position north of Gundus Bej is retreating in disorder as the result of an attack from our right. It is being closely followed up. In the direction of Hamidie we are not in touch with the enemy and there is no fighting going on. Bos Juk is in flames. The enemy has left the field to our troops; it is covered with the bodies of thousands of Greeks who have been killed. Ismet, Commanding on the western front. Angora, I st April, 1921. To Ismet Pasha, Commanding on the western front. Chief of the General Staff, Metresse Tepe, battle-field of Inongu. There have rarely been commanders in history who have taken upon themselves so difficult a task as you have in the battles at Inongu. The independence and the existence of our people were hanging on the patriotism and courage of their leaders and comrades in the army, who gloriously fulfil their duty under your command. You have not only defeated the enemy but at the same time have reversed the unhappy fate of the nation. The whole of our country, including the unfortunate districts occupied by the enemy, is cele brating your triumph to-day. The storm-wave of the enemy s attack has been shattered against the hard rock formed by your patriotism and energy. In congratulating you on your great triumph and this victory, which will record your name honourably in the annals of history and which fills the whole nation with eternal gratitude to you, I want to tell you here that the high pinnacle on which you stand is not only overlooking a glorious battlefield strewn with the bodies of thousands of the enemy, but from its summit the eye can also discern the horizon of a future for our people and yourself that is resplendent with glory. Commanding on the western front. A short report of what took place in the zone of our southern front. I shall not enter into details about the heroic deeds performed by our infantry and cavalry in the pursuit of the defeated enemy, who abandoned the battlefield of Inongu for the second time and retired to his old positions in the direction of Brusa. I will only ask you to allow me to complete my account of the military operations by giving you a short report of what took place in the zone of our southern front. Three infantry divisions under the command of Refet Pasha, who commanded the southern front, were in a prepared position at Dumlu Punar. Besides these, there was a division and a brigade of cavalry. They were on the left of our position. The object of the commander of the southern front was to hold the enemy in his position. Three divisions of infantry and some of the cavalry, which came from the positions east of Ushak, came into action and attacked the positions at Dumlu Punar. On the 26 th March our troops were obliged to abandon these positions. The commander of the southern front divided his forces into two parts, because he was not able to bring his troops to a halt on a firm line and make new dispositions. One part consisted of the 8 th and 23 rd Infantry Divisions and the 2 nd Cavalry Division, and these retired under his orders in the direction of Altyntach. The other part, under the command of Fahreddin Pasha who was in command of an Army Corps, consisted of the 57 t]tl Infantry Division and the 4 th Regiment of Cavalry. The enemy turned against Fahreddin Pasha with all his troops and advanced eastwards, leaving only one regiment to face Refet Pasha s force. Later on Refet Pasha ordered the 23 rd Division to join Fahreddin Pasha and marched them southwards via Altyntach. When it was discovered that the enemy made no move in the direction of Altyn tach, Refet Pasha was called to the north with all the troops he had with him. The advance of the enemy towards the east compelled Fahreddin Pasha to retire to the east of Afium, fighting in different positions. The enemy, after having occupied Afium Kara Hissar, advanced to the line Tshai Bulvadin, where he halted. Against these enemy troops Fahreddin Pasha extended a line consisting of the 25 th and 23 rd Di visions, as well as the 4i st Division, which had arrived from the district of Adana in the south. Although I think that I ought to abstain from too many observa tions of a strategical nature, I would like to point out to you an error in the general offensive plan of the Greek army which commands attention. The Ushak force belonging to the Greek army ought to have ad vanced from Dumlu Punar in the main direction of Eski-Shehr. The enemy, by sending his troops via Afium in the direction of Konia, removed them from the place where a decisive result could have been reached and, condemning them to inactivity, put them in a dangerous position. As we had gained the victory at Inongu, there was no doubt that nothing was left to do but to secure their retreat as soon as possible to save them from danger. It was probable that our troops who had been victorious at Inongu would advance on Dumlu Punar via Eski-Shehr and Altyntach and, being able for a great part of the distance to make use of the railway, they would intercept the line of retreat of the Greek army which was east of Afium Kara Hissar and would inflict upon it an annihilat ing defeat. Indeed, no time was lost in carrying this out. The first divisions that were disengaged were immediately placed at the dis posal of Refet Pasha, commanding the southern front, and were sent forward. The Ushak troops of the Greek army began to retreat immediately the battle of Inongu had come to an end. On the 7 th – April, 1921, Refet Pasha had his headquarters at Tshekurler; the 4** and ii th Di visions were in the Altyntach zone; the 5 th Caucasian Division and the battalion of Guards of the Assembly to the strength of one regi ment, south of Tshekurler; the I st and 2 nd Cavalry Divisions in the district of Kutayah. The 4 th , 5 th , II th , 8 th and 24 th Divisions coming from the north and the 57 th , 23 rd and 4i st Divisions advancing from the east, that is to say, a total of eight divisions and a battalion of infantry. The I st and 2 nd Cavalry Divisions had been ordered to go to Banas, which was in the enemy s rear, and having been led there by long detours, they could only come effectively into action if the enemy was de feated. They took no part at all in the battle on that day. The troops under Refet Pasha s command were not successful in their attack, but, on the contrary, suffered heavy losses. The enemy consolidated his position commanding Dumlu Punar and remained there. As for Refet Pasha s troops, they retired and halted on the line Ai Demir Tshai Keui Selki Serai, tenkilometres from Dumlu Punar. Thus ended this operation, which has been called the battle of Assilhanlar. One fact misled Refet Pasha as to the issue of the battle. Thanks to a turn which had taken place in the firing line during the battle and on account of the impossibility of our troops to beat and put out of action a regiment which the enemy east of Afium Kara Hissar had left at Dumlu Punar, the advanced part of the Greek army had retired to their main position which they intended to hold after their retreat to Dumlu Punar. Whilst Refet Pasha was actually defeated himself, he thought that the enemy was beaten and in retreat, and he reported this to us in a telegram, in which he said that after the battle of Dumlu Punar had been going on for five days he had given the enemy his deathblow. Naturally, this news was very satisfactory to us and we hastened to send him our praises and congratulations. However, from the replies I received to questions which I sent to him personally from the telegraph instrument, we became doubtful whether the position had been described to us as it actually was and we had our suspicions. Eventually we found out that the enemy had taken up a strong position which commanded the surrounding country, was easy to be defended and, in the opinion of the enemy, perfectly satisfactory. Refet Pasha felt himself compelled to retire further with his troops to the line Ai Demir Tshal Keui Silki Serai. When the situation had quieted down to some extent .we under stood that the army commanded by Refet Pasha had lost confidence in him. In order to examine the situation on the spot, His Excellency Fewsi Pasha and Ismet Pasha, the former from Angora and the latter from the western front, started for Refet Pasha s headquarters. As it was considered advisable to let Refet Pasha remain in command for some time longer, they tried to look upon the matter and settle it with this in view. Both were convinced, however, that it was impossible to let matters rest as they were, so I went personally to see Refet Pasha, accompanied by Fewsi Pasha and Ismet Pasha. I went into the matter very carefully and soon came to this con clusion: Combining the southern front, commanded by Refet Pasha, and the western front, I placed both under the command of Ismet Pasha and I ordered Refet Pasha to return to Angora and take up his duties there. When Refet Pasha returned to Angora I thought over the follow ing solution: Ismet Pasha would resign his post as Chief of the General Staff and would devote himself exclusively to the extended western front. His Excellency Fewsi Pasha, Minister of National Defence, would take over the duties of Chief of the General Staff he had hitherto been acting in that capacity. Refet Pasha would become Minister of National Defence, which office had fallen vacant. I do not know how it was possible that I was not able immediately to detect the secret intention concealed in Refet Pasha s suggestion, for I had never considered the point of view that came to my mind a little later. To clear up the point which appeared doubtful to me, I asked him this question: “If I understand you rightly, this means that you want to become Chief of the General Staff?” I must admit that he did not give me a direct reply, but I assumed that this is what he had in his mind. Then I remarked: The administration of the General Staff is &gt; according to our organisation, actually the po sition of the Commander-in-Chief . You do not posses the qualifications that are necessary for the post of Commander-in-Chief of the Turkish army. Put this idea out of your head for the moment.” Refet Pasha replied: “In that case I shall not accept the appointment of Minister of National Defence.” “That is your affair,” I said, and so the con versation came to an end. He actually declined the offer, went on leave and retired for some rest to a place called Edshevid in the forests of Kastamuni. It was only in a later situation that Refet Pasha became Minister of National Defence. Our delegation which had gone to London returned to Angora after the second victory of Inongu. You are aware that the Con ference had not led to any result. Bekir Sami Bey, Foreign Minister, who had been at the head of the delegation, had, however, entered on his own account into connection and discussion with the statesmen of England, France and Italy and had signed a number of special agreements with each of them. According to one of the agreements between Bekir Sami Bey and England, we were to release all the English prisoners of war who were in our hands. England in exchange was to return ours, with the exception of those of the Turkish prisoners who it was alleged had brutally or badly treated English prisoners or Armenians. Our Government could naturally neither approve nor ratify such an agreement, because this would have meant that they would recognise a kind of right of jurisdiction on the part of a foreign Government over the acts of a Turkish subject in the interior of Turkey herself. As, however, the English released some of the prisoners, although we had not ratified the agreement, we on our part released some of the English prisoners. Kemal Pasha 3 2 Crescent, and the English Comissioner at Stambul, the exchange of all the Turkish prisoners at Malta and all the English prisoners in Turkey was decided upon, a decision which was duly carried out. It appears that Bekir Sami Bey, besides his official negotiations and discussions, had had an interview of a strictly private nature with Lloyd George . . . The actual words that passed between them had been taken down in shorthand … A protocol had been signed . . . I do not remember that I had been informed of the contents of the copy which was in the possession of Bekir Sami Bey. Although I have recently asked him through the intermediary of the Foreign Office for a copy of it, Bekir Sami Bey has informed the Minister by letter that translations of this copy had been put before me at that time and that the original as well as the translations had remained among the documents to which they belonged when he left the Ministry of Foreign Affairs. This document, however, could not be found among the others. Nobody in the Ministry of Foreign Affairs knows anything about it or what it contained. As far as I am concerned, I do not remember ever having been informed of the existence of this document. Another agreement was also signed on the II th March, 1921, be tween Bekir Sami Bey and M. Briand, President of the French Council of Ministers. According to this agreement the hostilities be tween France and the National Government were considered to be at an end . . . The French were to disarm the bands and we on our part the armed volunteers . . . French officers were to be employed in our gendarmerie. The gendarmerie organised by the French was to be retained . . . The French were to have the preference in enter prises for the economic development of the districts evacuated by France, as well as the provinces of Mamuret el Aziz, Diarbekr and Sivas, and, in addition, were to be granted mining concessions in Argani, etc. . . . I do not consider it necessary for me to refer to the reasons which led our Government also to reject this agreement.